Athletics & Recreation Fall Sports & Fitness Festival this Saturday, August 30! HOUGHTON, Mich. — Michigan Tech Athletics and Recreation is hosting a Fall Sports and Fitness Festival at the Student Development Complex on Saturday, Aug. 30. This interactive, three-hour event from 6-9 p.m. will showcase Tech’s facilities, athletic teams and programs for sports and fitness to incoming Michigan Tech students and the community. All are welcome to attend this free event. There will be complimentary hot dogs, popcorn, coffee and pop served in the MacInnes Student Ice Arena along with other food items for purchase. There will also be plenty of giveaways. Guests should come prepared to play. Interactive stations with Michigan Tech student-athletes will be set up in the MacInnes Student Ice Arena, SDC Gym, Multipurpose Gym and at Sherman Field and the Tech Trails. All of the SDC’s facilities including the pool and fitness center will be open and free to use for the evening. There will also be community program sessions for patrons to try. Both season and single-game tickets for all Tech sports will be on sale during the event. Fans can check out seats before they purchase tickets. Home openers for each sport are:Sept. 4 for volleyball, Sept. 5 for soccer, Sept. 20 for football, Oct. 31 for hockey, Nov. 15 for women’s basketball and Dec. 11 for men’s basketball. For more information, visit http://www.michigantechhuskies.com/sports/articles/2014-15/SportsFitnessFestival. Registration Now Open for Fall Community Programs @ Michigan Tech Rec! New to Community Programs? Want to change up your workout? Try out a Fall class for only $2 during Dollar Days, September 2-6! Adult Fitness Schedule – Ready or not, here Fall comes! Good thing we got an awesome line up of fitness classes to ward off the chill in the air! Variety of Yoga classes, Core & More, Pilates, Zumba, Aikido, Spinning, Conditioning, PiYo, Aqua Zumba, Aqua-Fit, Swimming and Skating. Youth Classes – Fall doesn’t have to be a drag… all books, tests and homework! We’ve got a cool lineup of classes that will have your child chomping at the bit for school to start! Choose from Hockey, Skating, Tumbling, Swimming, Aikido and Dance. Community Programs has something for everyone. 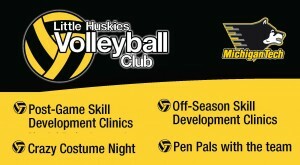 Little Huskies Volleyball Club Now Open for Registration! Little Huskies Volleyball Club is now open for registration! K-8 boys & girls are encouraged to participate! Post-game clinics, free admission to home games, and lots of special events! For more information, visit http://www.michigantechrecreation.com/programs/youth/2014LittleHuskiesVBclubFlyer.pdf. 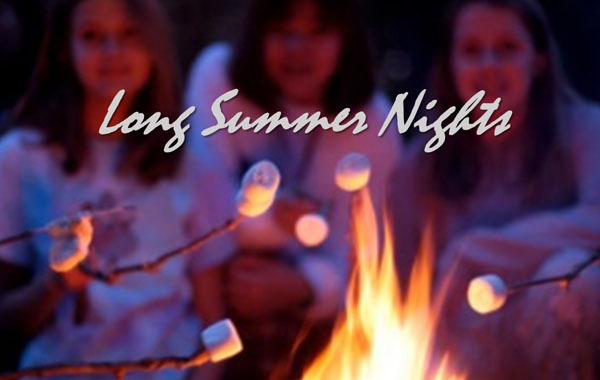 these last few long summer nights contemplating the Fall Community Programs lineup! Slip back into a familiar groove with favorites like Zumba or Aikido or anticipate a new challenge with Ashtanga Yoga or PiYo. We have something for everyone! Registration for the Fall session begins August 25. Sample select classes for $2! Fall Session programming begins September 8! The complete Fall program guide will be available next week! Last Chance to Register – Learn to Skate Camp! Get ready to have fun, on the ice and off. This year, Michigan Tech’s Learn-to-Skate Camp is themed Skating Through the Stars—space travel is exciting, and so is our skate camp! Daily activities include skating lessons, group routine practice, and organized skating games. Off of the ice, skaters will help in the design of costumes, set, and props for the exciting end-of-week show. If you’re ready to learn skate basics, there’s no better—or more fun—way to do it! For more info and to register online, visit us here.